Images (c) Company One Theatre 2018. *Original Music by Kelly Rowland, David Guetta, New Edition, Jay-Z, Beyonce, Destiny’s Child, Nina Simone. The nature of the script did not allow for traditional scene transitions in that each scene moved seamlessly from one scene to the next. In order to support the blocking and lighting movements in these scene shifts I needed to develop page turns to function as transitional beats. When I asked the Playwright what they heard in their mind's ear to represent the two houses of conflict in the script, he said crystal and metal. I used this as my inspiration to create the page turns by electrifying, burning, and rubbing crystal orbs to represent shifts into the protagonist house scenes and doing the same with sheet metal for the antagonist house scenes. 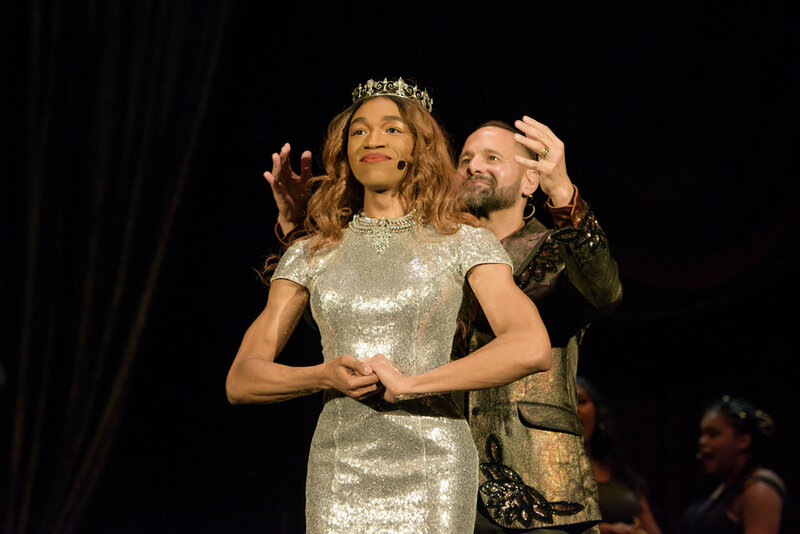 The climax of the play takes place at a Drag Masquerade Ball featuring lip-synced movement sequences or stage battles between performers. My favorite to create was the Wicked Witch Sequence where a performer, in full regalia, interacted with the audience by mouthing the lines from movies that have been very influential in the LGBTQ community.